Product Modifiers are used to provide guests with options when ordering from the menu. There are two kinds of modifiers, forced and unforced. Forced Modifiers - Require the selection of one of the modifiers to place an order for the product. Unforced Modifiers - Allow you to provide optional changes to a menu item but are not required to place an order. Even if some of the toppings are the same between Pizzas and Sandwiches, this makes taking orders much quicker and easier for the servers and prevents confusion in the kitchen. ● In the left-hand navigation column, click on Menu. Then click Modifiers. If you don’t have any modifiers created yet, you’ll be taken immediately to the New Modifier Group window. ● Set the name of the Modifier Group. Require Selection - Check this box if you want to create a Forced Modifier. This requires the selection of at least one modifier in the Modifier Group. Allow Multiple Selections - Check this box to allow more than one modifier in the Modifier Group to be selected. This option can be applied to forced or unforced modifier groups. ● Click Save, and you’ll be taken to the Modifier List for this group. 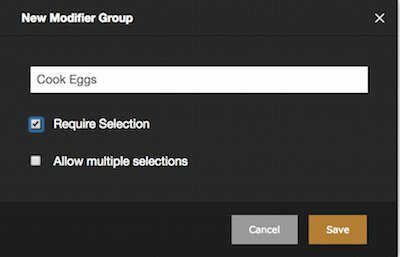 ● To create an unforced modifier group, leave Require Selection un-checked. ● To add a modifier to the group, click the + Modifier button. The Add Modifier window appears. ● If there is an additional cost for this option, set the amount to be added to the price. ● Attach a Modifier Option by clicking the drop-down menu. These are the modifiers that were created for our example: 2 Egg Breakfast. Cheese, Salsa, Mushrooms, Green Onions and Extra Slice of Bacon. 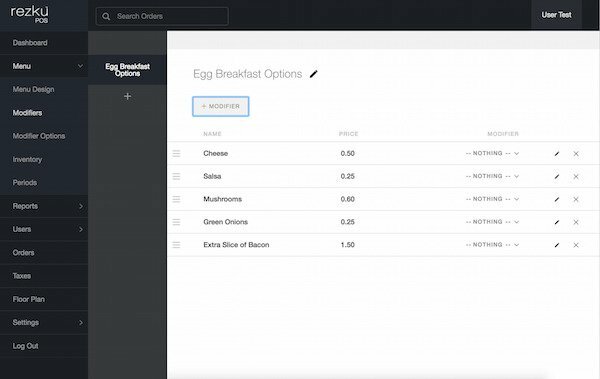 Each of the modifiers optionally has an additional cost added to the base price of the two egg breakfast. To edit modifiers: click the pencil icon on the right side of the row with the modifier name. 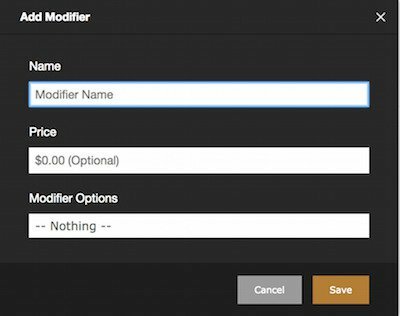 To delete a modifier: click the X on the right side of the row with the modifier name. In the next example, we’ll create a set of forced modifiers for the 2 Egg Breakfast, so our kitchen knows how to cook the eggs. ● In the Modifiers area of Back Office, click the + button on the center column, at the bottom of the Modifiers List, in the column to the left. The New Modifier Group window appears. ● Enter the modifier group name. ● To make a forced modifier, check Require Selection. ● Click the name of your Modifier Group in the left column. This is the Modifier Group list. ● Type the name, additional price, and choose any Modifier Options. 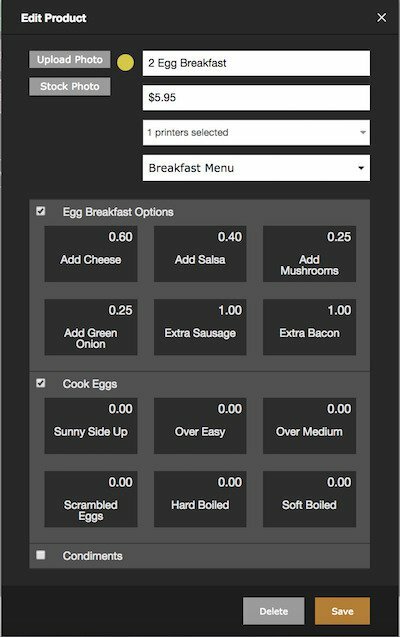 Because this is a forced modifier, the waitstaff must tap one of these options to order the 2 Egg Breakfast. In the Modifier Group list, just to the left of the modifier name, are 3 gray lines. When you click and drag here, you can move modifiers up and down in the list. To use Product Modifiers when ordering, the Modifier Group must be attached to the product. When creating or editing a product, you can choose which Modifiers to include. In Menu Design, find the product you want to edit and click to open the Edit Product window. Detailed instructions here. ● From the Edit Product window, check the box next to any Modifier Group. When you check the box to attach a Modifier Group, the Product Modifiers appear as tiles. ● In the Edit Product window, selecting a modifier makes it an ingredient. When you make a modifier an ingredient, it is included by default. Tapping the tile it in Rezku POS will remove rather than add it. This is a very useful way to build items such as burgers. By making the burger toppings modifiers, removing frequently held ingredients, like onions, just takes a quick tap.